Publish of any sensor that is connected to it. Subscribe and pass messages to any input. Subscribe to send SMS messages to contacts listed in contact list. 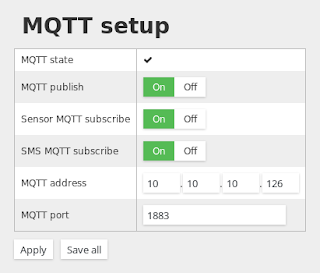 There is simple panel, screenshot on right picture, allowing you to set the MQTT server IP address and it's port, and enable or disable this function globally. 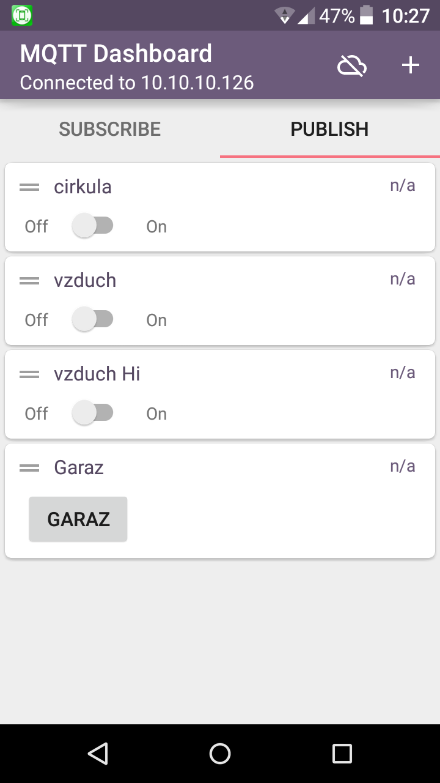 Domoticz or any Home Automation System connected, all of them allows MQTT. Any mobile device gateway for MQTT like MQTT dashboard on Android. 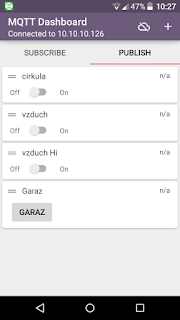 Where you can in minutes create buttons, dials, or switches to trigger actions on your nodes, like in the picture on left. NodeRed an excellent piece of software for more advanced automation system. I use it for logging sensor values to database.